Ghalebsaz-Jeddi, B., Donohue, G., Shortle, J. (2009). A Statistical Analysis of the Aircraft Landing Process. Journal of Industrial and Systems Engineering, 3(3), 152-169. Babak Ghalebsaz-Jeddi; George L. Donohue; John F. Shortle. "A Statistical Analysis of the Aircraft Landing Process". 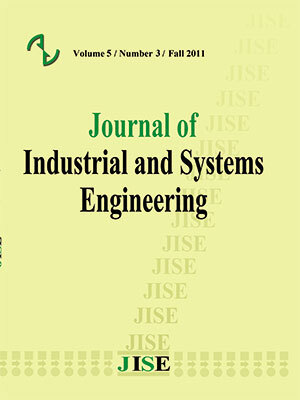 Journal of Industrial and Systems Engineering, 3, 3, 2009, 152-169. Ghalebsaz-Jeddi, B., Donohue, G., Shortle, J. (2009). 'A Statistical Analysis of the Aircraft Landing Process', Journal of Industrial and Systems Engineering, 3(3), pp. 152-169. Ghalebsaz-Jeddi, B., Donohue, G., Shortle, J. A Statistical Analysis of the Aircraft Landing Process. Journal of Industrial and Systems Engineering, 2009; 3(3): 152-169. Managing operations of the aircraft approach process and analyzing runway landing capacity, utilization and related risks require detailed insight into the stochastic characteristics of the process. These characteristics can be represented by probability distributions. The focus of this study is analyzing landings on a runway operating independent of other runways making it as a single runway. We provide statistical analysis of the final approach and runway occupancy time at Detroit airport at peak traffic periods on one of its major landing runways. Many weeks of aircraft track record data collected by a multilateration surveillance system is analyzed. We explain some characteristics and short comings of the database, and extract samples of the random variables of interest (i.e. aircraft time and distance separation, runway occupancy time, simultaneous runway occupancy, and aircraft speed). We estimate probability distributions of these variables under both instrument and visual flight rules. Although the focus here is on one runway at a large airport, probability distributions of these random variables for the landings on similar single or independent runways (with similar physical design, operating systems and landing guidance instruments) shall be alike. Guidance, Navigation and Control Conference; AIAA-2001-4359 (Vol. 3). Bowker A.H., Lieberman G.J. (1972), Engineering Statistics; 2nd Ed, Prentice-Hall, Inc.
 FAA Order 7110.65 (1993a), Air Traffic Control., Wake Turbulence, Para 2,1,19, , September. Operations Research; George Mason University, Fairfax, VA.
 Hollander M., Wolf D.A. (1999), Nonparametric statistical methods; 2nd Ed., John Wiley & Sons, Inc.
(ICRAT), Belgrade, Serbia and Montenegro. Law A.M. (2000), ExpertFit, Averill M. Law & Associates. Nolan M.S. (2003), Fundamentals of air traffic control; 4th Ed., Brooks/Cole Publishing Company. Transportation Research Board 1915; 69-78. Ross S.M. (2007), Introduction to probability models; 9thEd., Amsterdam; Boston, Academic Press. Hazards for Landing Aircraft; Transportation Research Record; DOI: 10.3141/2007-11. model parameters for landing time separations; 92PM-AATT-006, March.